I’m back on dry land, hurrah! However I now go by the name ‘captain’ (or just cap’n to those who know me well) and I smoke a pipe. I’ve also been trying to grow a beard, but so far no luck. With minimal cooking facilities on the boat (an oven that barely worked, and about six inches of worktop), we were forced to be a bit creative, or resort to cheese sandwiches three times a day for a week. As much as I love cheese, even that doesn’t appeal to me. So instead, I made a chickpea sandwich filling that vaguely resembled the one I posted last year. And I guess I’m now on a bit of a chickpea salad kick, because it’s only taken me two days to make another version – this time a lemony walnut chickpea salad with goat’s cheese, red onion and rocket (that’s arugula to some of you, and ‘that frilly green stuff’ to others). This salad / sandwich filling has a little bit of everything – sweetness, tanginess, crunchiness, pepperiness (are these even words? ), and it all goes together perfectly. Just a couple of tablespoons of mayonnaise holds it all together nicely, but if you’re one of those (weird) mayonnaise haters, you could always experiment with using yoghurt or sour cream instead. I served mine stuffed inside a pitta bread, but you could have it plain or with salad leaves if you prefer. It’d pack up nicely into a lunch box too. Combine all ingredients in a large bowl, and mix well. Season to taste. Serve on bread, in a pitta pocket, or with salad. Love, love , love this recipe! Thanks so much for sharing! My husband really likes it, too. Last time I made it he ate nearly all of it–all I got was a large spoonful! Guess I’ll need to double it next time! Amazing!! I’m devouring it as I type this. I added chopped tomato and salted the onions before adding them in so they wouldn’t be so strong. This is so good.. thanks for sharing! I am now a HUGE FAN!! I love this quick and easy recipe! I did substitute Feta cheese for the goat cheese only because I already had the Feta in the fridge. I am hooked! Thanks Maria! :) Feta sounds like a great substitution! The recipe is awesome, and cleverly simple ! Another book mark for me. Regarding your Question on anyone soaking and boiling chickpeas. I do that every time I am making some curry out of chickpeas. Coming from India, its kind of a habit and hence “no second thought” thing for me. But yes, if i have to whip up a quick hummus or may be Chickpea Pilaf sort of thing where i know I wont be using more than a cup of them, I simply use a can full. This the second recipe I’ve tried on your blog and was pleasantly surprised. 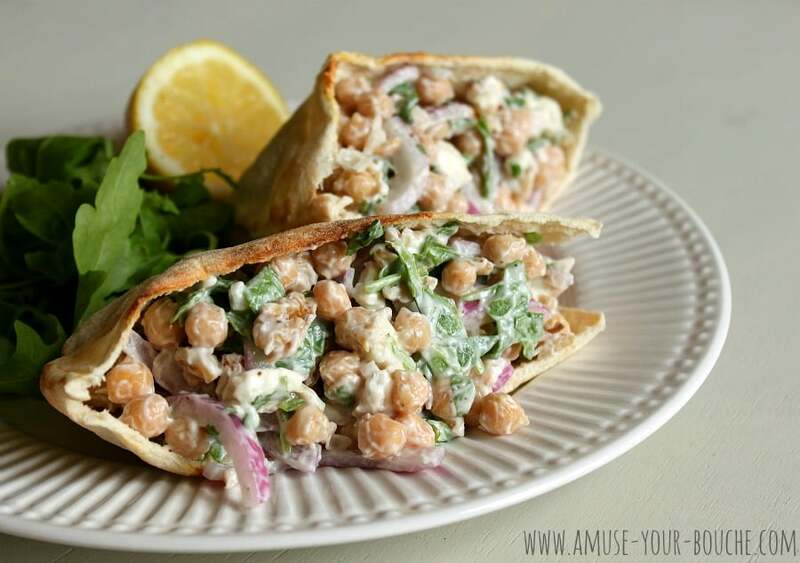 It was a perfect filling for the pita….lots of protein and flavors…creamy with a nice crunch from the walnuts. Can’t wait to make this again! Thank you! Then I let them cool, then portion them into baggies (need a more eco-friendly method for this) and freeze them. I use them for everything! Can’t wait to head to Trader Joe’s to get the ingredients for this!! Loveeeeeeeee this recipe! 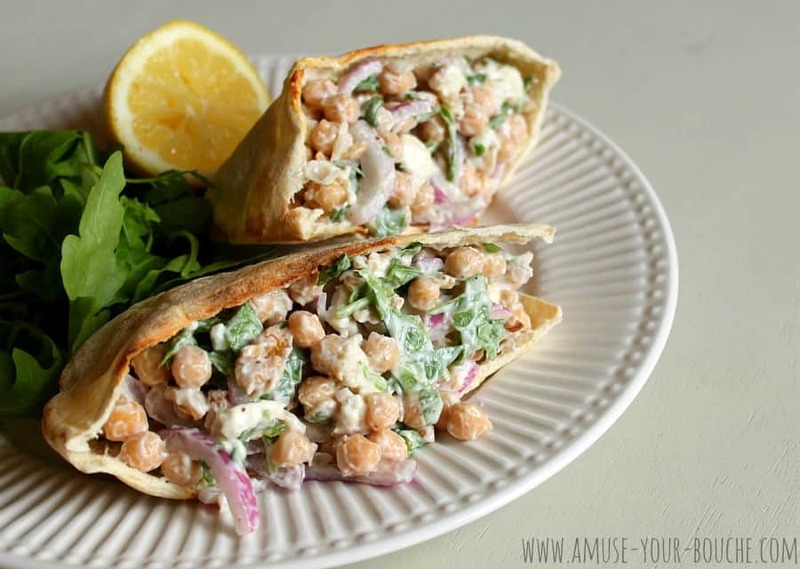 I toast my pita pocket….mouth watering! And I leave a little on side to eat on its own. Whoa! These look INCREDIBLE! Literally perfect dinner for a post run meal! So much nutrition, and goats cheese is my absolute favorite! I need to try these right now. YUM! Hi Becca! I can’t wait to try this! It looks so delicious . Delicious. Ate with toasted walnut bread which worked well. Love your site. Veggie paradise. That sounds fantastic! I actually haven’t made this recipe in a while, I think I’ll have to make it again soon and try it your way :) thanks for stopping by! Hope to have you back soon! I make a similar chickpea salad but it doesn’t have the walnuts or goat cheese. I’ll have to give your version a try! Pinned! I’m loving the look of this. Chickpeas in sambos are my new day-dream subject of choice. I’m thinking about zucchini, chickpeas and parmesan. But I like the look of this too, so will give it a try. This looks delicious, will be trying ! I cook my own beans all the time, both for price and avoiding the cans (and liners). I like knowing what goes in there for sure, and I also find that the chick peas I boil at home make a far better hummus. By far the easiest way for me is to use the crock pot. I just toss the dry beans in with water and let it cook for a couple of hours on high. I store them in glass jars in the freezer. Oooh I love the idea of using the slow cooker, I think even I could manage that ;) maybe I’ll give it a go! That looks delicious! I have been using goats cheese in just about everything recently, love the stuff. 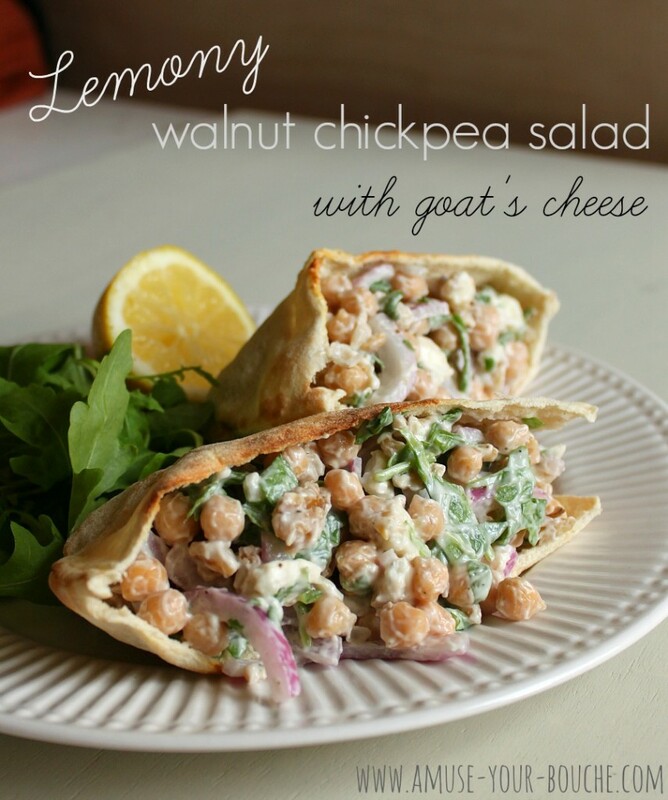 And chickpeas have been one of my favourites for years so this is right up my alley! Thanks for sharing! This looks so good and fresh. Love how simple and yummy it is. This looks and sounds incredible. I will definitely be trying this recipe out soon! Aw is it expensive? I get a lump of 120g for £1.28, so the cheese in this recipe only cost about 50p. Feta could work too if that’s any cheaper for you? Ya :( unfortunately a small container here is about $5-6. I might try it with feta though, what a great idea!! The simplicity and fresh flavors of this dish are so great! Would love to grab them for a quick lunch. Well, I definitely soak and boil all kinds of beans, including chickpeas, but I don’t see that much difference in taste. It’s more of a difference in price! This salad sounds so good–fresh & perfect for a summer lunch. One advantage of soaking is that, to speed things up, you could just soak for 2-3h and then boil for ca. 45-60 mins. If you boil in broth, it’s a way of adding extra flavor. Thank you for this recipe! Just made it. It’s awesome. Topped it off with some green (mild) salsa, which worked well too. Dried beans taste MUCH better. I have only used dry recently. They are also more economical. I still have the canned beans(chick peas, pinto, etc.) on hand because I don’t always plan well. This recipe looks yummy. I am going to try it ASAP! Thank you. Also wondering about the dried version, as I’ve only had canned chickpeas, too. Ooh yes avocado could work! Good idea!